I’m starting a new blog series that will run bi-monthly to highlight ways our current customer base uses our products with the intention to help our current customer’s with new ideas or reach out to new customers we may be able to assist. If you have any ideas or you want your line of business featured just leave a comment or shoot me an email. I’d love to hear from you! At Burris Computer Forms we’ve always had a large church customer base because many churches take on the responsibility of handling their business internally with volunteers from the congregation and are on a limited budget. Many of our products are items that can be utilized within a church and can fit within any budget. Today I wanted to take some time to go through a few of our more popular products and hopefully shed some light on money saving options for your church! Keep in mind, all of our products have free downloadable templates for Word and/or Publisher to help you get started (we’re also available by email or phone all week too). We also have no cost samples of every product we sell so you can test first and buy with confidence after! 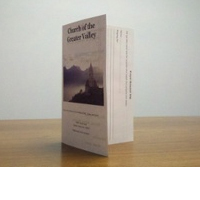 Easily our most popular church product, we have standard blank church bulletins which are scored (creased) as a half fold so once printed they can, without extra effort or time, be folded perfectly for each service. You can see our standard half fold here. Some churches also prefer a trifold bulletin which can be found here. Many of our churches also prefer to have bulletins with a built in perforated card. This can be used as a Comments card or a Prayer List card. 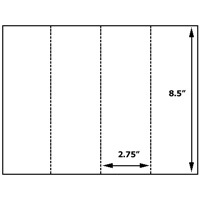 The bulletin is actually 8.5″x14″ and the 3″ card once detached leaves a half fold standard sized bulletin. While this is a larger piece of paper since its width is unchanged it is still compatible with all printers. Take a look at the bulletin with a detachable card! Churches also make use of our Four-of-a-Kind postcards as great comment cards. We’ve seen them also used for prayer lists, suggestions and probably many more uses we haven’t been told of! You can visit our website and see our standard Four-of-a-Kind postcards which come in many colors as well as our postcards with a detachable card on the bottom. Many churches have special dinners and/or events for their congregation and to raise money for various needs. What fancy dinner is complete without a name plate (place holders) on the tables for when your guests arrive? We offer standard tent cards that come two cards to a sheet and are perforated for easy separation after printing and we also have panel notecards which have a square impression where the name/information goes and looks just a bit fancier than a standard tent card. This is a section my mom would be proud of. When I was a child she taught Sunday School and also spent plenty of time watching the nursery. She was a teacher of young children as her day job and that means she was very resourceful. All you need to entertain kids are lots of colored pencils, crayons, markers and something to be creative on. While you’re picking up your bulletins check out our 5×7 greeting cards so the kids can make their parents Christmas, Easter, Mother’s Day, or Father’s Day cards. Take a look at our bookmarks so they can create their own unique bookmark and be happy to use it and read when they get home. We’ve got more kinds of paper than I could list in a week so browse around and be creative! 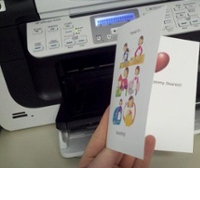 10 Ways to Use a Blank Bulletin with a Tear Off Stub. 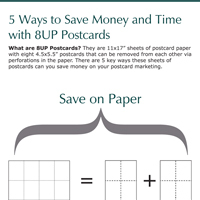 Blank Church Bulletins with Tear Off Stub 5 Ways to Save Money and Time with 8UP Postcards [Infographic] How To Make Sure You Have a Card for Every Occasion and Save Money.